Professionally overlay current scoreboard information on top of live or recorded video! Score banner is an optional screen that is available on some of our most popular scoreboards. It displays the same score information as the main scoreboard, but in a more compact form so that it can be displayed over game video. The screen can be enabled and customized in the scoreboard's options. The score banner screen allows complete configuration of scoreboard elements, size, position, and colors. Change colors, adjust the order of fields, and add/remove fields in the scoreboard options. 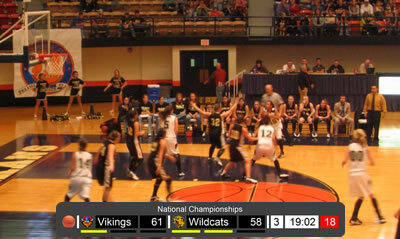 Drag and drop the score banner anywhere on the screen, then resize the score banner to be as large or small as required. All score banners can be overlayed using a user selected chroma-key color or floating window, providing you with flexibility for overlaying the score bug over game footage.